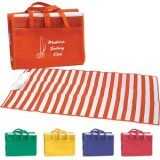 A great favor for your pool party or beach-themed bash. 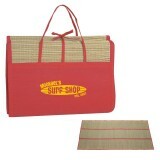 Each sturdy woven plastic beach mat measures 5 feet, 3 inches long and 2 feet 8 inches wide so it's roomy for kids and adults. 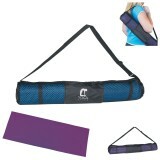 The mat has an attached, inflatable pillow and the whole thing easily converts into a handy carrying case that measures 11 inches wide and 7 inches tall. 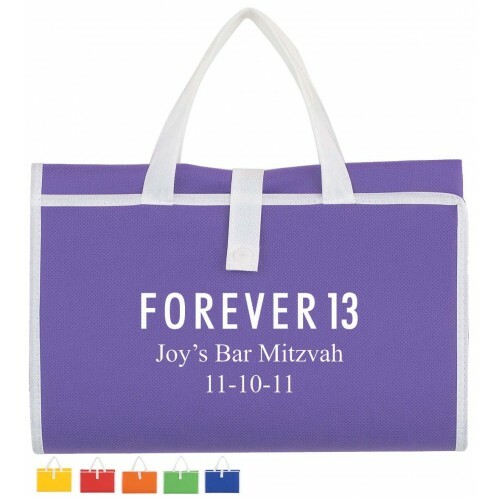 Just choose your beach mat color, then find your favorite themed design and we'll add your name and mitzvah date in bright white ink to create your one-of-a-kind favor. Wondering what your personalized graphic will look like? No problem! You'll have the chance to approve your design before we print your favor.